Changing my diet to raw living foods has indeed brought me some of the greatest joys in my life, which is just as important, if not more, that everything else I’ve done. I discovered a different way to look at one’s health, and I was able to overcome diseases naturally and without the need of medicine, which can be one of the most profound life experiences any person can go through. My change to eating raw foods didn’t happen overnight. I went through different stages over many years. I started by eating a plant based diet (or WFPB as it is called). This step was relatively easy and straight forward. I never liked calling myself “vegan”, because even though I align myself with the ethical side of the movement one hundred percent, I consider the regular vegan diet with its restaurant foods, stir-fried veggies, grains, oily dressings, and fatty desserts to be just as unhealthy as the average person’s diet. Even MacDonald’s and Häagen-Dazs started selling “vegan food” these days, so you get the idea. After adopting WFPB, the other big dietary moment I experienced was quitting white potatoes. Wow, I’ll never forget this because I felt much less heavy afterwards, and I stopped being constipated too – which was caused in part by eating this type of starch. But one of the greatest pleasures I experienced was when I finally managed to quit eating grains – even wholegrains. This was my last remaining addiction, which can be, for some people, just as strong as trying to quit nicotine or alcohol. It’s is very common for folks to experience severe cravings for grain products, such as bread, pastries, and pizza. This happens because wheat contains addictive opioids  that affect our central nervous system. They induce changes in how we feel, as well as our moods, cognition, and behaviour. How often you hear people say they cannot give up eating bread or cereal? The problem with eating grains, as to with every other addiction, is that you don’t know when to stop. The issue for me got so bad that it started affecting my digestion in a big way. I suffered from cramping, bloating, overall gut dysfunction, and poor immunity in general. Plus, I couldn’t seem to shake my fatigue. I stopped going to the gym regularly too, because I simply didn’t have the energy. Pic taken at Pinamar beach in Argentina during the peak of my grain intake and looking notably bloated. It was Hippocrates who said, “all diseases begin in the gut.” While some of his beliefs and theories have been found to be based on incorrect anatomy and physiology – most have stood the test of time and are recognized for their wisdom over 2.000 years later. Throughout my experience of eating grains, I can and do echo this sentiment, as it does feel like the stuff of death when compared to how well you feel while eating plants. Dr. Douglas Graham, author of Grain Damage writes: a substance known as phytic acid, found in raw cereal grains, is well known for its tendency to bind with calcium and interfere with its absorption. Grains also contain substantial quantities of acid-forming minerals, such as phosphorus. During the process of digestion, the body must yield up calcium from the bones, a powerful alkaline mineral, in order to neutralize the acidity of grains. Eventually, people on a high-grain diet run predictably low on calcium, often resulting in a common bone thinning condition known as osteoporosis. Grains contain very little calcium, and they are also low in sodium, choline, iodine, sulfur, and other alkaline minerals. On the other hand, fruits and vegetables contain from ten to one hundred times as much calcium and other alkaline minerals as grains, when measured in terms of calories. The list of health problems associated with eating grains is long. Asthma, allergies, gluten intolerance, celiac disease, digestive disturbances, mucous and congestive conditions, yeast infections, several types of arthritis, several types of autoimmune disease, and even chronic overeating are all linked to the consumption of grains. This is not to say that grains are all bad, for they are a far better choice than animal food alternatives. However, the healthiest choices are fruits and vegetables. Much less mucus production to the point that I don’t have to carry a tissue with me when I go out. No eye discharge when I wake up. If you are unsure how your health will improve by quitting grains, trying going on a grain free diet for 15 days and see how you feel. It’s not much to lose, is it? You replace grains by eating fruit and vegetables. Make sure to eat plenty of fresh fruit to top up for those missing calories. At dinner time, you can prepare delicious grain free, raw food meals – such as raw wraps and raw pizzas, that will taste and feel just as crunchy as grainstuff, but without the bad side effects. If you really want to help the environment, start off by looking at what you put in your mouth. Half of the topsoil on the planet has been lost in the last 150 years due to unhealthy eating habits. Replacing crop fields with orchards is the way forward to protect our health and save the environment. Whereas grain crops lead to depletion and loss of precious topsoil, orchards pull their water and nutrients from deep down in the subsoil, assist in the building of topsoil, protect the soil from erosion, and aid in nutrient recycling, as well as encourage biodiversity. Trees also act as grand air filters, causing particulate matter to fall to the ground. As we replace fields of grain with orchards, we can expect our air to become cleaner, sweeter, and healthier for us. Beyond grain-based vegetarianism, a diet of raw fruits, vegetables, and nuts will actually regenerate the earth. Going “against the grain” as they say, may as well be the healthiest choice you’ll ever make. Are you looking for easy ways to boost the nutrition power of your meals? 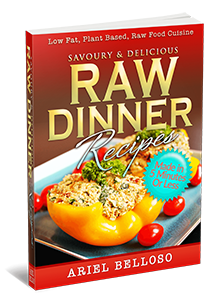 Check out our exclusive grain and oil free meals in the essential guide: Raw Dinner Recipes – Made in 5 minutes or less. Cutting grains out should be left solely to those that are celiac and require gluten free. Even at that, this needs to be closely monitored by a Dr and supplements need to be implemented!Telling a cardiac patient to cut out important whole grains is detrimental to their health! How was the flax wrap made? I agree! I also quit grains in 2012 and I remember my addiction to them well. How do you feel about raw soaked or sprouted buckwheat that is used in some raw recipes? To Wen: Please read “Improving On Pritikin You Can Do Better” by Ross Horne and understand how whole grains harm people’s cardiovascular health by making the arteries tight. To Wen: Please read “Improving On Pritikin You Can Do Better” by Ross Horne and understand how whole grains harm people’s cardiovascular health by making the arteries harden. What do you think about sprouted grains? Thank you for the article. What about nuts, and beans? Pearl barley 24.4 carbs, 0.3 sugars. So, you could e.g. eat twice as much organic brown rice than ordinary white rice for the same amount of carbs! I suspect that the organic part makes a difference – more natural fertiliser in the soil (dung! and its associated microfauna) rather than blitzing everything with chemicals, and therefore it’s more nutritious and you won’t feel bloated because you’re eating less. So, don’t give up grains people, but read the labels, and go organic!